Obtaining a Bigger Voice: How to Speak so Others Will Listen! In this webinar, you’ll learn how to have a “bigger voice” – how to be a more effective and persuasive communicator in speech, writing, and presentations. We’ll talk about the challenges and fears women face when communicating in the tech workplace and discuss ways to overcome them. You’ll leave the webinar with tools, tips, examples, and resources that you can use to develop a bigger voice today! 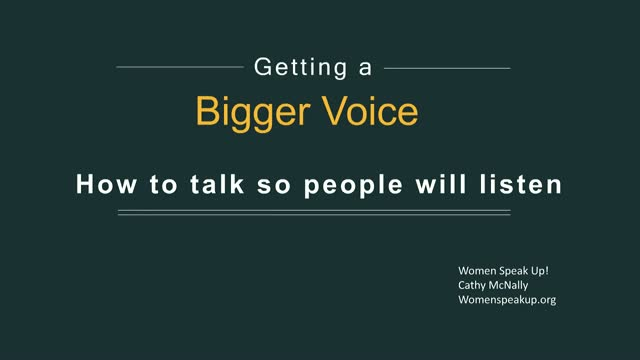 Cathy McNally is Founder and CEO of Women Speak Up, a speaker training organization for women who want to change the world. Cathy is passionate about helping people communicate so that they can effect change. She is a coach, speaker and trainer; learn more at womenspeakup.org. Cathy McNally, Founder and CEO, Women Speak Up! Title: Obtaining a Bigger Voice: How to Speak so Others Will Listen! Presented by: Cathy McNally, Founder and CEO, Women Speak Up!